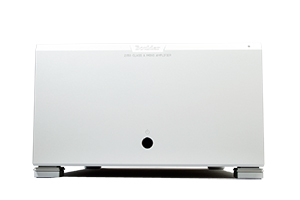 Boulder Amplifiers has announced the debut and release of the 2110 preamplifier and 2150 mono amplifier, shown first at the 2013 Hong Kong High-End Show, held August 9 through 11, 2013. The original 2000 series was in continuous and unchanged production since 1996, making the 2100 series the first and only revision of 2000-level products in 17 years. The 2110 and 2150 will be the first components in the new and expanding 2100 series of products. 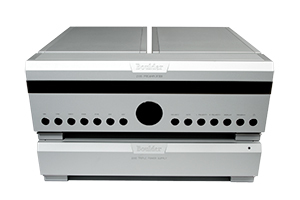 The 2100 series is said to be Boulder’s highest-performing continuously produced product line. It encompasses Boulder's latest technology and thought regarding high-performance home-audio reproduction. The 2100 series reportedly marks a substantial increase in performance over the previous 2000 series. The suggested US retail price for the 2110 preamplifier is $54,000 USD and the 2150 mono amplifier is $49,000 ($96,000 per pair). International export prices will vary by country. With the exception of the front-panel buttons and volume-control disc, every part and circuit of the 2110 preamplifier is new. The complete preamplifier is comprised of four chassis and features the total isolation of left and right audio channels, logic and user-interface sections, and power supplies. A separate 2100 power-supply chassis houses four independent power supplies for left audio, right audio, logic and user interface, and standby/power-on. A new, microprocessor-controlled, high-efficiency standby function reduces power consumption while in standby mode. Complete surface-mount circuit-board construction manufactured on Boulder’s own surface- mount pick-and-place machines and ovens to increase reliability, consistency, and optimized ground planing while at the same time reducing signal-path length, PCB capacitance, and noise radiation. New, ultra-low-noise, surface-mount 993S gain stages encased in a fully machined and potted housing for thermal stability. Redesigned high-visibility white LED front-panel display. New, modernized front-panel designs for both preamplifier and power-supply chassis. The preamplifier front panel features a new wraparound, custom-ground, mirror-glass display window. Next generation of Boulder’s CMOS-actuated stepped volume control incorporates full-balanced operation for a lower noise floor and elimination of any step noise. Full IP control via Ethernet for use with advanced control systems. 12V trigger out for remote turn-on of connected amplifiers. New, completely machined casework milled on Boulder’s own CNC machining centers. Sheet metal has been eliminated and all casework is now interlocking machined 6060-T6 aluminum. Powder coating and paint have been removed. 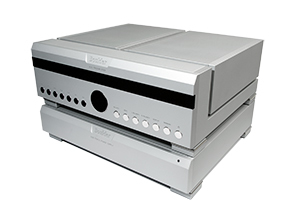 The complete preamplifier’s finish is bead blasted and clear anodized. Every electronic circuit within the 2150 mono amplifier is entirely new and all technological changes are primarily derived from Boulder’s 3050 mono amplifier. Pure-linear class-A operation. Bias current is actively monitored and adjusted in order to increase efficiency and reduce wasted radiated heat energy. A new, high-efficiency, microprocessor-controlled standby mode reduces power consumption when engaged. All electronic circuits and electronics are now surface-mount designs manufactured on Boulder’s own surface-mount manufacturing machines and ovens to increase reliability, consistency and optimized ground planing while at the same time reducing signal path length, PCB capacitance, and noise radiation. Gain stages within the 2150 are Boulder’s proprietary 99H2, which is unique to the 2100-series amplifiers. 99H2 gain stages feature surface-mount electronic design and feature a new machined and potted housing to increase thermal stability. The 2150 utilizes 80 output devices, 48 filter capacitors, and three toroidal power transformers to generate power output of up to 1000W into any load, enabling massive current swings and the ability to drive any loudspeaker to realistic audio levels. Full Ethernet IP control capability and a 12V trigger minijack connection for use with advanced control systems and triggered home-cinema installations. A new and complete array of protection and status monitoring circuits are continuously active. The physical and cosmetic changes in the 2150 include a slightly revised front panel and a new clear-anodized top, bottom, and rear panel with no powder coating or paint. All rear-panel markings and indications are now machine engraved. Metal casework is cut using Boulder’s own CNC machines.